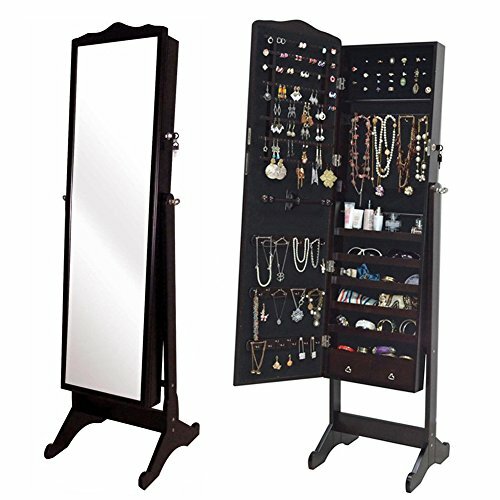 This stylish piece of jewelry armoire is great for ladies that love their jewelry displayed in a classy way. It makes it easy to choose your beauty jewelry in the morning without the frustration of looking for loose/missing pieces. It stores all of your jewelry safely with lock and in a organized manner. It features an elegant, space-saving design MDF wood construction, large size full length mirror and 2 small drawers. FEATURES: Full length mirror front; 4 -level adjustable angel; Sturdy MDF wood; Black inner lining; Lock and key; Easy assembly required. * 2 Bottom drawers for the small accessories.